Have news or event notifications you'd like to submit? Click Here! Dennis Mills, of Exploration Instruments in Austin, Texas, has been named General Chair of SAGEEP 2019 being held in Portland, Oregon USA March 17-219, 2019. Additionally, Dimitrios Ntarlagiannis of Rutgers University ([email protected]), will serve as Technical Chair for the core SAGEEP sessions, This year, explained Mills, SAGEEP adds two "sister" conferences, which will run concurrently. Co-sponsor European Association of Geologists and Engineers (EAGE) and EEGS previously announced that the two co-located conferences, "Geohazards" and "Shallow Marine/Coastal Geophysics".will be available to all attendees during the SAGEEP week for a single registration fee. "With the classic environmental and engineering topics coupled with the specific, focused subjects like Geohazards and Shallow Marine issues, there is plenty of opportunity to include a wide range of subject matter," said Mills. Joseph Coe ([email protected]) will serve as Tech Chair for the Geohazards Conference and Christopher Leech ([email protected]) is Tech Chair Shallow Marine Conference. The Call for Abstracts has been issued and the submission site is open! until Nov. 19, 2019 (click on SAGEEP 2019 for details). The American Geosciences Institute and the American Institute of Professional Geologists will be hosting a webinar as part of the Geoscience Online Learning Initiative (GOLI) called “A Journey through the Geology and Aquifers of New England and Why Groundwater Wells Need to be Re-developed.” The webinar will be on Thursday, August 30th at 1:00 PM EDT. Raymond Talkington, Ph.D., P.G., C.P.G., J. Theodore Morine, P.G., C.P.G., and Frank Getchell, P.G., C.P.G. will be speaking at the event. This webinar will take participants on a journey through the formation of the glacial and bedrock geology of New England and provide information on why and when a groundwater well in this geological terraine needs to be re-developed. If you have any questions about the webinar, please contact AGI’s Workforce Development Specialist Heather Houlton at [email protected]. The Frank Frischknecht Leadership Award is established to recognize an individual who shows extraordinary leadership in advancing the cause of near surface geophysics through long-term, tireless, and enthusiastic support of the environmental and engineering geophysics community. Such leadership is often boldly displayed by an invention, a new methodology or technique, a theoretical or conceptual advancement, or a unique innovation that transforms the nature and capabilities of near surface geophysics. 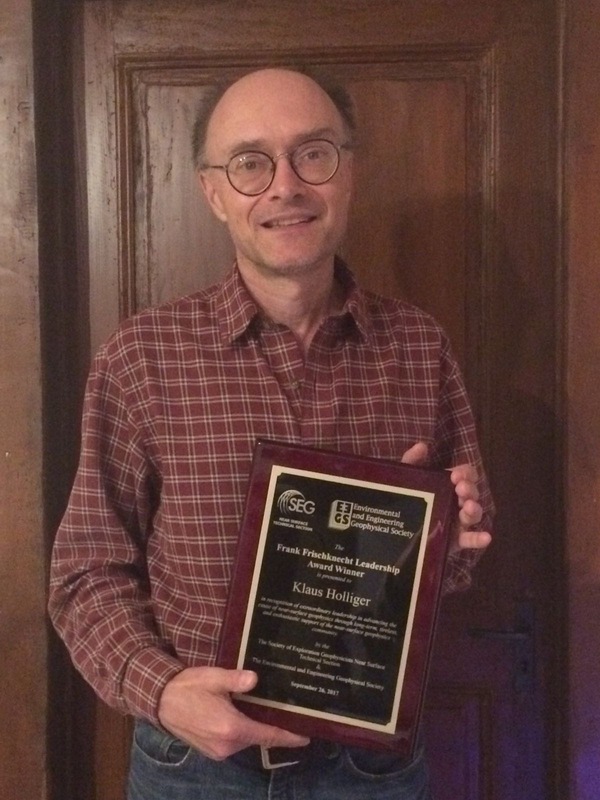 The Frank Frischknecht Leadership Award is presented jointly by EEGS and the Society of Exploration Geophysicists, Near-Surface Geophysics Technical Section. Past recipients of the joint award include Klaus Holliger, Esben Auken, Motoyuki Sato, and Andrew Binley. Send nominations to Laura Sherrod, chair of EEGS' Nominations and Awards committee, by email to [email protected]. The nomination should contain the name, title and affiliation of the candidate along with a statement describing the reasons for the nomination. Nominations should be received by Monday September 17, 2018 for full consideration. To learn about additional past recipients of the Frank Frischknecht Leadership Award or information on other EEGS awards, please visit the EEGS web site www.eegs.org/awards. As the Guest Editors, Profs. Lanbo Liu (UConn) and Rongyi Qian (CUG-Beijing) invite you to submit papers under the theme of “Geophysics for Urban Underground Space Studies” (GUUSS) to be published as a special issue in Journal of Environmental and Engineering Geophysics (JEEG, 2017 Impact Factor:1.52) for its June 2019 issue. All papers on planning and design, data acquisition, analysis, and interpretation pertinent to the development of Urban Underground Space are welcome. All papers presented at the special session on ‘Urban Underground Space’ sessions of SAGEEP2018 are encouraged to submit, with the expansion and completion with more rigorous description of the development of the algorithm with case study support. Research papers on this topic which did not presented at SAGEEP2018 are also welcome to submit. The authors can submit their manuscript to http://jeeg.allentrack.net/. The author should state in the cover letter that the manuscript is for the special issue: “Geophysics for Urban Underground Space Studies”. All submitted papers will be reviewed by two peers and one of the guest editors to assure high standard set by JEEG. The review process for this special issue is quicker than the regular issues and we expect fast turn-around and the wrap-up by the end of 2018. The authors should be aware that JEEG charges for color figures ($100 USD per figure), so there should be a statement in the cover letter to make it clear that the authors are willing to pay the color figure fee. Otherwise, grayscale figures are free. There are two options for publication, both of which are a peer reviewed publication with all of the privileges held by such: A regular research article of at least 3000 words and generally 1-2x figures per 1000 words; and a Near Surface Geophysical Letter (NSGL), a shorter communication that advances emerging research and case studies. We ask that for NSGL, the size be limited to 2000 words and up to 4 figures. Final acceptance date: December 31, 2018. In December of 2017, the EEGS Board of Directors voted to move to offer a digital Journal of Environmental & Engineering Geophysics (JEEG) exclusively. Beginning with the March, 2019 issue, members and subscribers will access the Journal online only. JEEG Editor Dale Rucker said this move to the digital production of the JEEG will have a minimal effect on the publication's content. JEEG's impact factor, a measure of the yearly average number of citations to recent articles, has risen to 1.52 (SCIMAGO) and 1.39 (SCOPUS), JEEG's highest since inception. EEGS Foundation Opens Online Auction! The EEGS Foundation On-Line Auction is live and ready for your bid. The Foundation is auctioning tickets to two (2) very unique yet thoroughly "Nashville" events: A Night at the Grand Ole Opry; and a Professional Hockey Night in Nashville. The winning bidders will be announced at 7:00 PM on Sunday, March 25th during the SAGEEP 2018 Ice Breaker Reception at the EEGS Foundation Silent Auction Table. 2 tickets with VIP backstage tour. Performers include Trace Adkins, Terri Clark, Charlie Daniels Band, and Lorrie Morgan. More artists to be added. - With the Behind the Opry Curtain VIP Tour, an exclusive group of fans can experience the Opry as a true backstage VIP for the first time ever. You'll go behind the scenes in the exciting moments just before show time, learning from your knowledgeable guide and others about the inner workings of the show and watching Opry staffers and artists readying for another great night of music. There is much more! See details in the Auction description. Special note: We have received opening bids of $250.00 for the Grand Ole Opry tickets (face value of $520) and $150.00 for the hockey tickets (face value of $290.00). Additional details on seating and specifics to each event or presented on the auction page. The EEGS Foundation will also be holding its annual Silent Auction during the SAGEEP 2018 conference culminating with an announcement of winners on the morning of Wednesday, March 28th at the close of the first coffee break. The Foundation needs your contributions for the Silent Auction! Take Action Today by e-mailing Doug Laymon at [email protected] to declare and demonstrate support for the good work of the EEGS Foundation through the donation of an auction-able item. You can also bring your auction item to the SAGEEP 2018 registration booth. Your donation does not have to be a piece of geophysical equipment although that would be a grand and very welcome donation. Books on geology, mineral specimens, bottles of vino as well as a world of other items will work just as well as items more directly associated with the profession of geophysics. A form for donation can be filled out and sent to Doug Laymon at the above address. A special note for US taxpayers: The EEGS Foundation is a non-profit organization as defined by the Internal Revenue Service. Thus, the fair market value of your donations is deductible from your federal income tax in the tax year that you donate the item or cash. A donation to the EEGS Foundation will help Guide Technologies Today and Prepare for A World of Needs Tomorrow. The U.S. – Egypt Science & Technology Joint Fund has an open call for proposals for collaborative projects in several areas of scientific research. The deadline to apply is March 8, 2018. Proposals are now being accepted for two- or three-year collaborative U.S. - Egypt research grants. Egyptian junior scientists are also invited to apply for short term, non-academic training visits to U.S. institutions. For more information, visit: www.nationalacademies.org/egypt or www.stdf.org.eg or view the informational flyer . SAGEEP 2018 Registration is Open! It's time to look over the SAGEEP registration form and decide what things you want to do in addition to attending technical sessions and exhibits. The Technical Program that Andy Parsekian and Oliver Kuras (Technical Committee co-chairs) and their team have been assembled this year is outstanding, and Micki Allen has developed an excellent exhibition. But, you will want to get the most out of attending the conference, and should consider attending some of the additional events this year - there are some phenomenal opportunities to learn and to interact with colleagues, many of which are offered at amazingly low prices. Below is a synopsis of some of your choices. Register now for SAGEEP 2018 and make hotel reservations at the host hotel, Nashville Airport Marriott and Save - be sure to check out the door prizes for those who book at least 3 nights! Consult the Schedule at a Glance , an overview of the technical program as well as the other events and activities planned for SAGEEP 2018 in Nashville, Tennessee USA March 25-29, 2018 and register online or by printed form. The hotel reservations deadline is March 2. * Early bird conference registration deadline is March 2. * Pre-registration rates are available until March 12. * Register now and save! Under the guidance of Mark Dunscomb (an EEGS Past President), EEGS partnered with the Geo-Institute to produce the Jan/Feb issue of GEOSTRATA devoted exclusively to geophysical applications. GEOSTRATA is the official bi-monthly magazine of the Geo-Institute, a specialty membership organization within the American Society of Civil Engineer (ASCE). 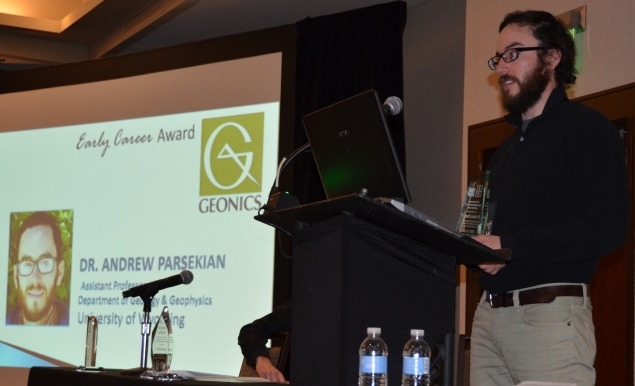 Mark’s goal was to help build connections between geotechnical engineers and geophysicists, including showcasing EEGS and the Geo-Institute Geophysics committee chaired by Brent Rosenblad, a recent EEGS Board member. The focus or theme that the papers were built around showed that geophysics is an effective and powerful tool to help inform geotechnical risk based solutions. Our thanks to Mark! The SAGEEP 2018 Expanded Abstract Submission Deadline is Monday, Dec. 11! Technical Co-Chairs Andrew Parsekian and Oliver Kuras remind SAGEEP Presenters a deadline to submit expanded abstracts is coming up! Make note of the last two deadline dates! Details about the submission process: Click here. 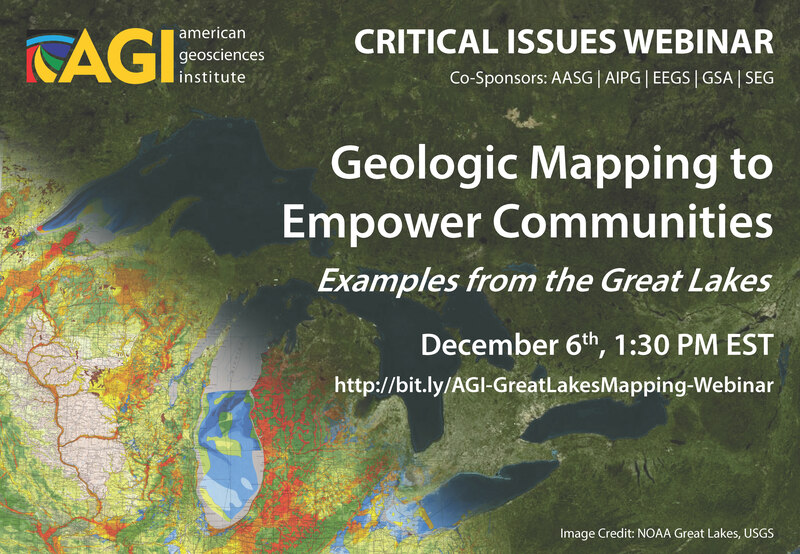 Critical Issues Webinar "Geologic Mapping to Empower Communities" Examples from the Great Lakes - Dec. 6th! 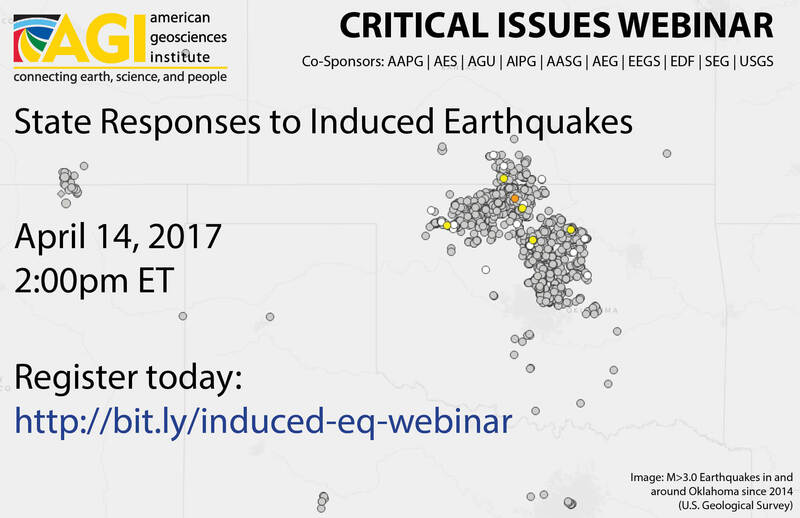 EEGS is co-sponsoring the American Geosciences Institute's (AGI) upcoming webinar on Wednesday, December 6 at 1:30 p.m. EST. 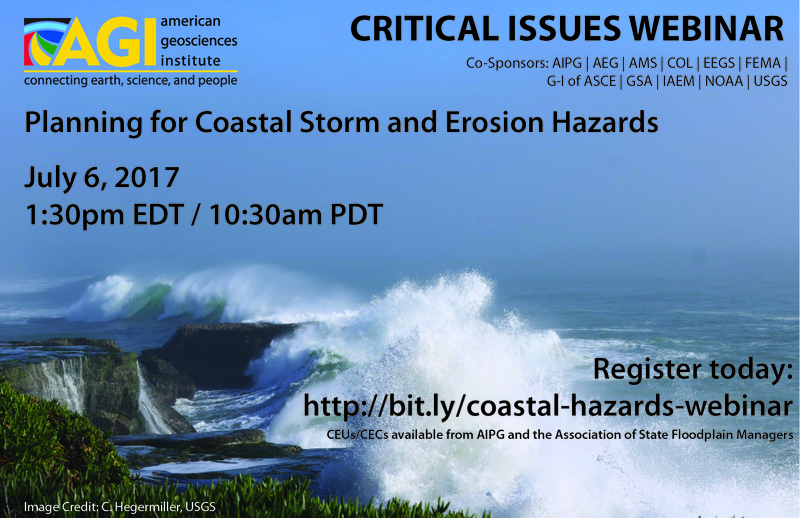 Please join this important webinar by visiting http://bit.ly/AGI-GreatLakesMapping-Webinar. Klaus Holliger received MSc and PhD degrees in geophysics from ETH Zurich in 1987 and 1990, respectively, and a postgraduate degree in economics from the University of London in 2000. After an extended postdoc at Rice University in Houston, Texas, he joined ETH Zurich's newly founded Applied and Environmental Geophysics Group in 1994. In 2005, he moved to a chaired professorship at the University of Lausanne, where he has served as vice-dean of research, head of the Institute of Geophysics, and head of the Center for Research of the Terrestrial Environment. He was awarded the ETH-Medal for his MSc thesis, a Paul-Niggli-Foundation Fellowship for his PhD thesis, the Latsis Prize of ETH Zurich for his postdoctoral research and SEG’s Harold Mooney Award for his more recent work. As a founding member Applied and Environmental Geophysics Group of ETH Zurich, he also shared SEG’s 2015 Distinguished Service Award. Klaus has served as editor-in-chief of the Journal of Applied Geophysics, as associate editor of Geophysics, Water Resources Research, Geology, and Solid Earth, and as co-editor of several books and special issues. He holds adjunct professorships at ETH Zurich and INRS in Quebec City, Canada, and recently accepted a part-time appointment as Pao Yu-Kong Chair of Applied Geophysics at Zhejiang University in Hangzhou, China. To date, he has advised more than 20 PhD students and postdocs, of whom 9 received high-level distinctions for their research achievements. Klaus has co-authored ~150 peer-refereed publications with ~2500 citations and an h-index of 29 (ISI). Newly Revised FastTIMES Available for Download Now! Vol. 22.2 has been revised as of Monday, Nov. 27 and is available for download and viewing - in both a high and low resolution interactive PDF format. For optimal viewing, FastTIMES' new editor suggests viewing the newly formatted publication after downloading to get full color and interactive PDF capability, rather than the limited version in the initial previewing screen. Many new features and viewing improvements have been made and he's pleased to offer readers a feature-rich, fully functional, quarterly magazine for the near-surface geophysical sciences. Page 10 of Vol 22,2 contains instructions on how to navigate around and use all the features of, the interactive PDF (e.g. enlarging the figures for better viewing). Download the low or high resolution PDF from the EEGS website at: eegs.org/FastTIMES/Latest Issue. Follow the new download instructions for both the low and high resolution PDF files. It is best to download the document and view it outside of a web browser with Adobe Acrobat. Also, if your web browser is Firefox, please clear private data before downloading. We encourage its distribution to a wide audience, so if you know of someone who might enjoy reading FastTIMES but may not be on the distribution list, feel free to forward the document or web link. Note: As well as seeking regular contributors (columnists) for planned expanded content, FastTIMES continues to look for Guest Editors who are interested in organizing a FastTIMES issue around a special topic within the Guest Editor's area of expertise. For more information, and if you are interested, please contact Geoff Pettifer ([email protected]) if you would like to serve as a FastTIMES Guest Editor or as a regular columnist. More information on the FastTIMES 2018 program will be forthcoming shortly. Please direct advertising inquiries to Jackie Jacoby ([email protected]). Our new FastTimes and JEEG editors are doing a great job in developing solid technical content for our publications! Special issues create an opportunity to identify and solicit advertising from special advertisers. However, our editors, focusing on content, don’t always have the opportunity to focus on our advertisers. The EEGS Board has identified the need for a Publications Advertising Editor or Publications Business Editor to focus on developing advertisers. Just like our current editorial teams, we need a business or advertising team to focus on advertisers. Are you up for the challenge? Please drop an email to [email protected] if you are interested in helping with the business side of our organization. The Department of Defense’s (DoD) Strategic Environmental Research and Development Program (SERDP) is seeking to fund environmental research and development proposals. 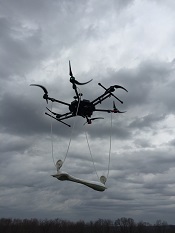 SERDP is DoD’s environmental science and technology program, planned and executed in partnership with the Department of Energy and the Environmental Protection Agency, with participation by numerous other Federal and non-Federal organizations. The Program invests across the broad spectrum of basic and applied research, as well as advanced development. Proposals responding to the Fiscal Year (FY) 2019 Statements of Need (SONs) will be selected through a competitive process. 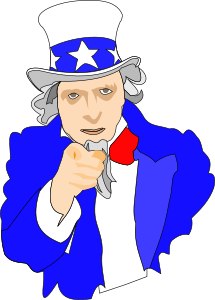 Separate solicitations are available to Federal and non-Federal proposers. The SONs and detailed instructions are available on the SERDP website. The Core SERDP Solicitation provides funding in varying amounts for multi-year projects. All Core Solicitation pre-proposals are due to SERDP January 4, 2018 by 2:00 p.m. ET. Intersociety collaboration is an important aspect of professional organizations. EEGS President Laura Sherrod has pledged support of The Society of Exploration Geophysicists of Japan's (SEGj) upcoming conference and appointed a member of the EEGS Board of Directors to the symposium's International Advisory Board. Dr. Michael Kalinski, EEGS Vice President Elect - Committees, has volunteered to serve as the EEGS representative. The Society of Exploration Geophysicists of Japan (SEGJ) is planning its thirteenth International Symposium on November 12-14, 2018 in Tokyo. The theme of the symposium is “What’s next? ? Technology for Discovery, Safety and Sustainability." The SAGEEP 2018 Abstract Submission Deadline is Tomorrow Nov. 3! Technical Co-Chairs Andrew Parsekian and Oliver Kuras have granted SAGEEP Presenters a deadline extension to submit their abstracts. Make note of the new deadline dates! New Editor, New Look and New Advertising Opportunity - FastTIMES on the Move! The September issue of FastTIMES will be focused on and targeted towards the California groundwater market and the customers of geophysical services within the market. New FastTIMES Editor in Chief Geoff Pettifer has gathered a wealth of articles about the application of geophysics to resource exploration and, more importantly, groundwater resource management. The issue will be distributed to the 5000+ members of the Groundwater Resource Association (GRA) as well as the administrators of the agencies tasked with administering a California State Grant Program designed to support the development and implementation of Groundwater Sustainability Plans through the state. This is a huge opportunity to create new business for the geophysical community. Advertising within the issue of FastTIMES will reach a large and important section of the professional community. EEGS is offering full page color advertisements at a rate of only $350. The deadline for submitting an order and advertisement is October 14th. Please act quickly!! E-mail your advertisement order and advertisement graphics to Jackie Jacoby at [email protected] before Friday of this week (10/13/17). For more information on advertising in FastTIMES, click here. New this year there will be a session devoted to Geophysics Education at the SAGEEP conference (March 25-29, 2018, Nashville, Tennessee). 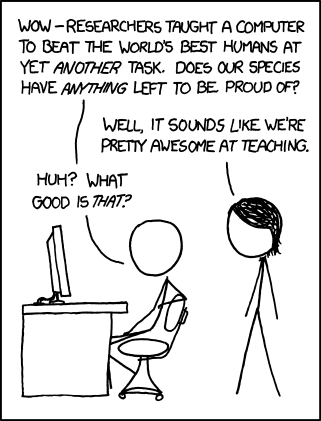 Share your classroom and lab ideas, field camp activities, nifty software, or pedagogical tricks of the trade. You can submit a short abstract (less than 300 words) here by October 20, 2017 and an optional expanded abstract by November 15, 2017. Send me an email if you have any questions. Editor Dale Rucker announced the publication and availability of the September, 2017 issue (Vol. 22.3). The Department of Defense's (DoD) Strategic Environmental Research and Development Program (SERDP) is seeking to fund environmental research and development proposals. SERDP is DoD's environmental science and technology program, planned and executed in partnership with the Department of Energy and the Environmental Protection Agency, with participation by numerous other Federal and non-Federal organizations. The Program invests across the broad spectrum of basic and applied research, as well as advanced development. Detailed instructions are available on the SERDP website. Call for Abstracts - Submit Online Now! Geoscientists from all over the world are invited to submit abstracts to SAGEEP 2018. (Details at SAGEEP 2018 web site: www.EEGS.org/SAGEEP 2018/Abstracts & Sessions.) The 31st SAGEEP will be held March 25-29, 2018 in Nashville, Tennessee United States, a region of North America with numerous attributes of interest to near surface geophysicists. Karst features, including Mammoth Cave, are abundant within a short distance of Nashville; a few hundred miles west lies the New Madrid fault zone, site of two of the largest earthquakes in the continental US (1811-1812), and east Tennessee has issues related to coal mining as well as chemical and nuclear wastes. The Tennessee river flows east to west across most of the state with numerous dams and levees. These features, along with topics of national and international interest (infrastructure, renewable and unconventional energy, water, geohazards,unexploded ordnance, etc.) will form the core of a timely and relevant technical program. Technical Co-Chairs Andrew Parsekian and Oliver Kuras are currently working on a compelling program and urge you to submit today and make note of the submission deadlines - abstracts are due 10/20/17! If you would like to help coordinate a session, please contact the technical co-chairs at [email protected] and [email protected]. The EEGS Board of Directors recently proposed bylaws revisions, one of which adds a third VP SAGEEP position (VP Pre-Elect) to plan for SAGEEP two years in advance. The EEGS Board oversees the planning of the annual symposium, SAGEEP, and in recent years, it has been a struggle to get the job done in a timely manner. Members of the Board extend thanks to all EEGS members who exercised their right to vote! 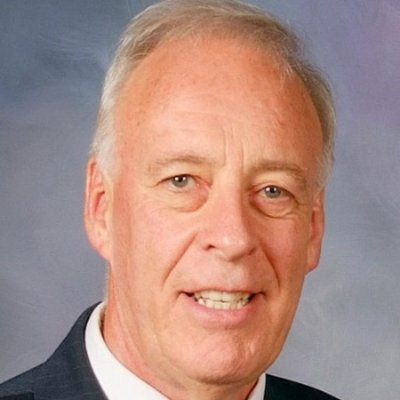 The Board has appointed Dale Werkema to fill the new SAGEEP position, VP Pre-Elect, until the formal election of Executive Officers and At-Large Board members next year. The revised Bylaws are viewable at EEGS Bylaws on the EEGS web site. The Nominations Committee is seeking nominations for two open Board of Directors positions: Vice President - Committees and At-large Member. This is a fantastic opportunity to become more involved and to help shape the future of EEGS! The VP-Committees is a two-year term and the At-large Member is a three-year term. Both terms begin at SAGEEP 2018. Please contact Beth Burton, Chair of the Nominations Committee, for inquiries and nomination submissions. Nominations will be accepted through Sept 30. Nominations for the EEGS/Geonics Early Career Award (ECA) are now being accepted. This award acknowledges academic excellence and encourages research in near-surface geophysics and includes a cash award and the opportunity to present their research during the EEGS Luncheon at SAGEEP 2018 in Nashville. Beginning this year, qualifying candidates from academia, the private sector, and the federal government will be considered. Visit the ECA page for more information on qualifications and submission requirements. A scientific-musical project started in Italy has transformed the TEM response of the subsurface to extract sounds strictly related to the geological setting. You can find more details here: www.emusic.world, including a video of an excerpt from an EM show into an archaeological site in Italy. Thank you EEGS Member and Associate Editor for the Journal of Environmental & Engineering Geophysics (JEEG) Antonio Menghini for this news item. If you have an item of interest to fellow geoscientists, please submit to [email protected]. The members and staff of EEGS extend our thoughts and concerns for those who have been affected by Hurricane Harvey. Recovery from this disaster of epic proportions will require coordinated efforts on many fronts including the near surface geophysical community. We encourage you to donate funds to the Red Cross, the Greater Houston Community Foundation or other certified action groups. EEGS is actively soliciting ideas and input for how the near surface community can aid in recovery activities. Please send your ideas and input to [email protected]. Call for Speakers - EEGS Student Chapters Need Your Expertise! EEGS Student Chapters are looking for speakers to visit their institutions and speak to the groups. The EEGS website will host a list of names and contact information of willing speakers on the Student Chapters web page. If you are willing to support our student chapters in this manner, let us know. Submit the following to [email protected]: your name, job title, contact information, a brief summary of your area of expertise or link to your website, and the state or regions in which you might be able to present. Your name will become part of the list, giving our student members the opportunity to tap your experience. The membership has voted and the results of the EEGS Board of Directors' proposed revisions to the Bylaws will be publicized soon. The EEGS Board of Directors has the task of overseeing the planning of the annual symposium, SAGEEP. In recent years, it has been a struggle to get the job done in a timely manner. To facilitate the task, the Board proposed revising the bylaws of the society, which currently, provides for two VP SAGEEP positions: one to plan the current SAGEEP and the second to plan SAGEEP for the next year. The proposed revisions alter the bylaws to allow for a third VP SAGEEP position to plan for SAGEEP two years in advance. SAGEEP 2018 will be held March 25-29, 2018 in Nashville Tennessee, a region of North America with numerous attributes of interest to near surface geophysicists. Karst features, including Mammoth Cave, are abundant within a short distance of Nashville; a few hundred miles west lies the New Madrid fault zone, site of two of the largest earthquakes in the continental US (1811-1812), and east Tennessee has issues related to coal mining as well as chemical and nuclear wastes. The Tennessee river flows east to west across most of the state with numerous dams and levees. These features, along with topics of national and international interest (infrastructure, renewable and unconventional energy, water, geohazards, unexploded ordnance, etc.) will form the core of a timely and relevant technical program. Technical Co-Chairs Andrew Parsekian and Oliver Kuras have announced session topics in preparation for announcing the opening of the abstract submission site. The deadline this year for submissions is October 20, 2017. If you would like to help coordinate a session, please contact the technical co-chairs at [email protected] and [email protected]. Questions or recommendations related to the conference can be sent to General Chair William Doll, [email protected]. Link to webpage: http://www.eegs.org/sageep-2018. A short course on Applying Drones to Geoscientific Mapping will be held at the Association of Engineering and Environmental Geologists annual meeting on 16 September 2017. Click here to learn more. A post conference workshop on Applying Drones to Geophysical Mapping will be held at the SEG Annual Meeting on 29 September 2017. Click here for more information. The National Academy of Engineering workshop on the Engagement of Engineering Societies in Undergraduate Engineering Education was held earlier this year and 5 follow on meetings on various topics are planned. The first follow up meeting, which will be on the idea raised at the workshop of creating a "Joint-Society" student challenge that encourages and demonstrates multidisciplinary solutions to the NAE Grand Challenges for Engineering, will be held on Sept. 18, 2017 in Los Angeles. Led by IEEE, more than 10 technical professional societies expressed a strong interest in exploring this idea at the workshop and several more have expressed interest since. If you would like to participate and represent EEGS in helping to create "solutions for humanity," please contact [email protected] and additional information will be provided. To continue the discussions, the NAE will be hosting the planning workshop on the campus of the University of Southern California. This one-day workshop will bring together engineering society leaders, engineering educators, students and other stakeholders to reach consensus on the competition concept and criteria and develop an implementation plan and timetable. It is anticipated that the competition will offer the professional societies a collaborative platform to reinforce their own efforts to impact undergraduate engineering education while engaging students in a 'big-picture" view of the role of engineering in creating solutions for humanity. Please share this announcement with your colleagues as appropriate. Space is limited and the workshop is by invitation. Those interested in attending or who would like more information should contact EEGS or Ken Jarboe at [email protected]. 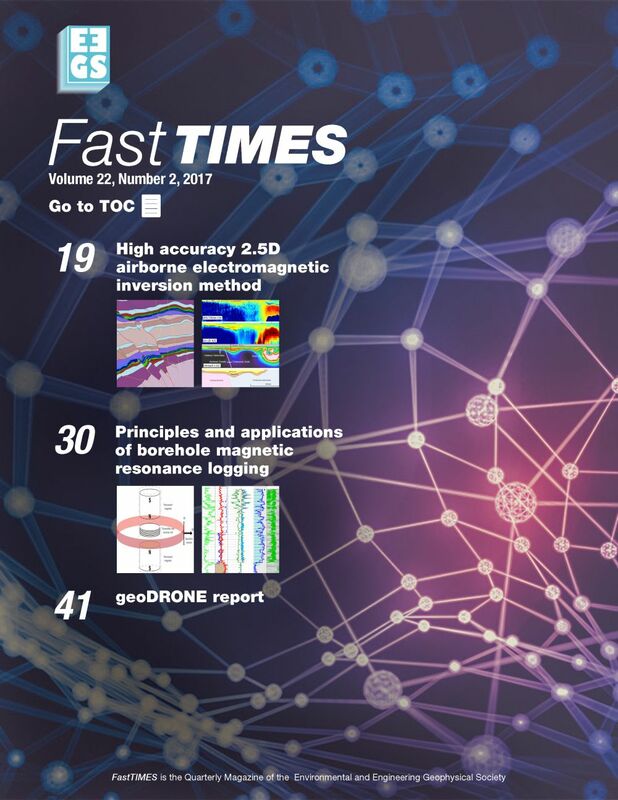 Special Issue of FastTIMES Just Published! Editor Barry Allred has published the latest issue of FastTIMES - a special issue, Environmental Geophysics. For the latest issue, click here. Editor Dale Rucker announced the publication and availability of the June, 2017 issue (Vol. 22.2). Entry-level Geophysics Position is the most recent job posting on the Geophysics Careers webpage - check it out! EEGS Going to the NGWA Groundwater Summit! Join fellow industry professionals from around the world at NGWA’s preeminent technical conference, the Groundwater Summit, which will be focusing in 2017 on “Instrumental to your Research and Practice." The Summit will be held during Groundwater Week December 4-7 at the Music City Center in Nashville. Its “All things Groundwater” and is a great place to catch up with colleagues, clients, and technology. EEGS will have a special session of approximately six invited papers selected from SAGEEP 2017. The papers cover a variety of topics in surface and borehole methods for groundwater applications. Learn more. Earth Science Week - How Will You Mark the Event? Since October 1998, the American Geosciences Institute has organized this national and international event to help the public gain a better understanding and appreciation for the Earth Sciences and to encourage stewardship of the Earth. This year's Earth Science Week will be held from October 8-14, 2017 and will celebrate the theme "Earth and Human Activity." This year’s event, the 20th annual Earth Science Week celebration, promotes awareness of what geoscience tells us about human interaction with the planet’s natural systems and processes. Earth Science Week 2017 learning resources and activities are engaging young people and others in exploring the relationship between human activity and the geosphere (earth), hydrosphere (water), atmosphere (air), and biosphere (life). This year’s theme promotes public understanding and stewardship the planet, especially in terms of the ways people affect and are affected by these Earth systems. To mark the occasion of the 20th annual Earth Science Week, AGI and key program partners are launching a slate of new initiatives, materials, and other offerings for participants throughout the year. 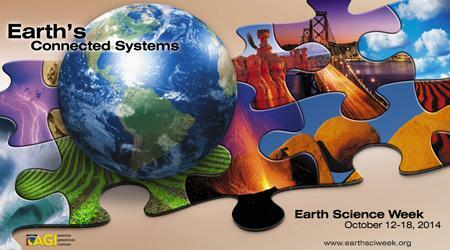 Details will be announced in the coming months at http://www.earthsciweek.org/about-esw. Want a Sneak Preview of the Next Issue of the Journal of Environmental & Engineering Geophysics (JEEG)? JEEG Editor Dale Rucker announced the availability of a new Advanced Preview listing for those interested in upcoming JEEG articles which have completed the peer review process and have been assigned a specific issue for publication. Check the listing each month for new additions.